Tamuna Liluashvili, Acting Director of Georgian National Investment Agency (GNIA), Ken Walsh, San Diego State University Georgia (SDSU Georgia) Dean and Magda Maghradze, Executive Director of Millennium Challenge Account-Georgia signed a memorandum of understanding (MOU). The main goal of the tri-party agreement is to assist the development of human capital by providing special trainings in engineering and technology and other fields, in accordance with investor demand. “Georgia’s profile as of an investment-friendly environment is becoming more and more popular among foreign investors who need professional staff locally-qualified workforce in engineering and technologies. 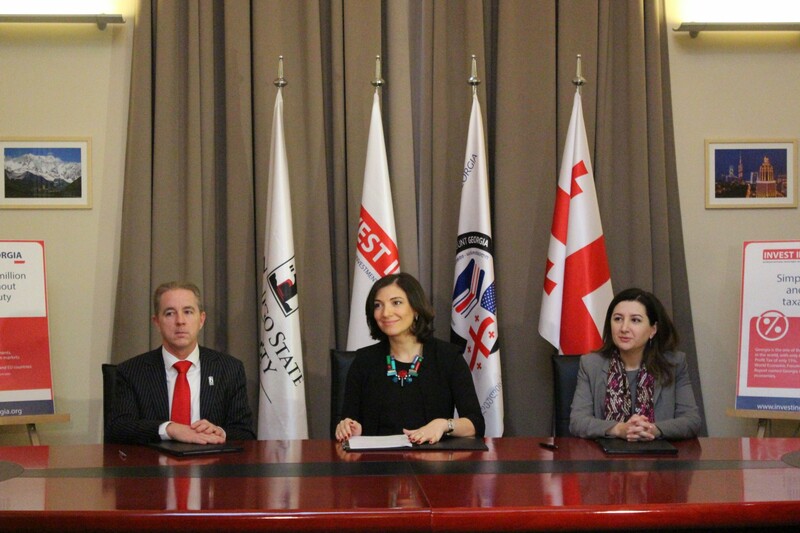 In the frame of the MOU, GNIA will assist SDSU Georgia graduates, trained through the project financed by MCA-Georgia, to get successfully employed,” stated Tamuna Liluashvili, Acting Director of GNIA. According to her, joint business forums and conferences will be arranged in order to set incentives for achieving the goal the MOU envisions. “Partnership with GNIA is very important for us as the agency gives a unique opportunity to offer SDSU graduates as qualified personnel to investors who are interested in Georgian market. MCA-Georgia is actively engaged in developing vocational education in the country,” declared Magda Maghradze, Executive Director of Millennium Challenge Account-Georgia. In 2013, the U.S. Millennium Challenge Corporation (MCC) and the Government of Georgia signed a $140 million second compact for Georgia to promote economic growth and reduction of poverty. The compact is an international agreement that describes support to strategic investments in general education, technical and vocational education and training, and higher education, with an emphasis on science, technology, engineering, and math STEM education. The goal of the Compact is to strengthen quality of education and professional skills in Georgia to contribute to the country's economic growth and development. In 2015 San Diego State University, in partnership with three Georgian public universities, was selected as a result of an international tender to offer U.S. bachelor's degree programs in the STEM academic disciplines in Georgia. The project will also enhance the capacity of Georgian public universities so that their STEM degree programs reach international quality standards and acquire international program accreditation. “The importance of the agreement is that it gives us a direct strategy to have education involved in the negotiations with companies who are considering creating operations in Georgia,” declared SDSU Georgia Dean Ken Walsh. In his words, San Diego State University has built its reputation in California through partnerships exactly like this.